Disc 1 is from Intro to A Stranger. Do NOT sell this recording. Do NOT EQ this recording. Do NOT modify the files in any way. Do NOT distribute this recording without ALL contained information. Do NOT convert to MP3. 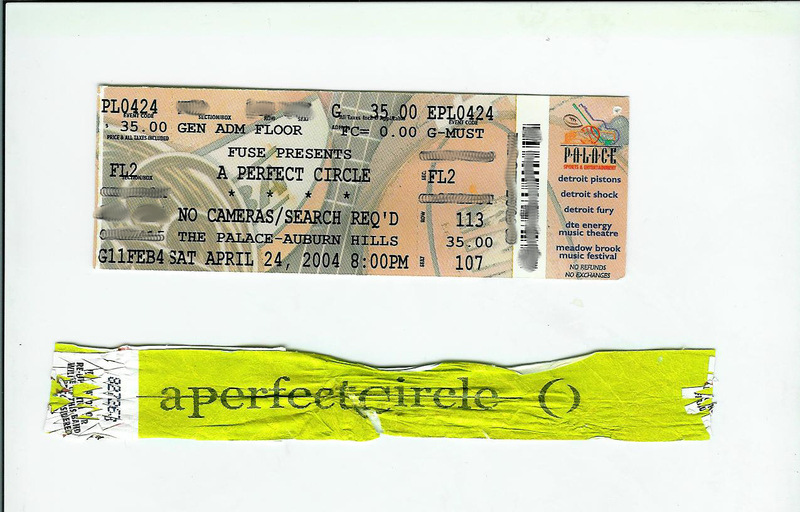 More may come from my archives of masters, Tool & other bands so long as people respect these simple requests. Go Tape! Slight level change during Vanishing. This recording was traded & sent to just a handfull of people about two years ago; figured it was time to get it out there. 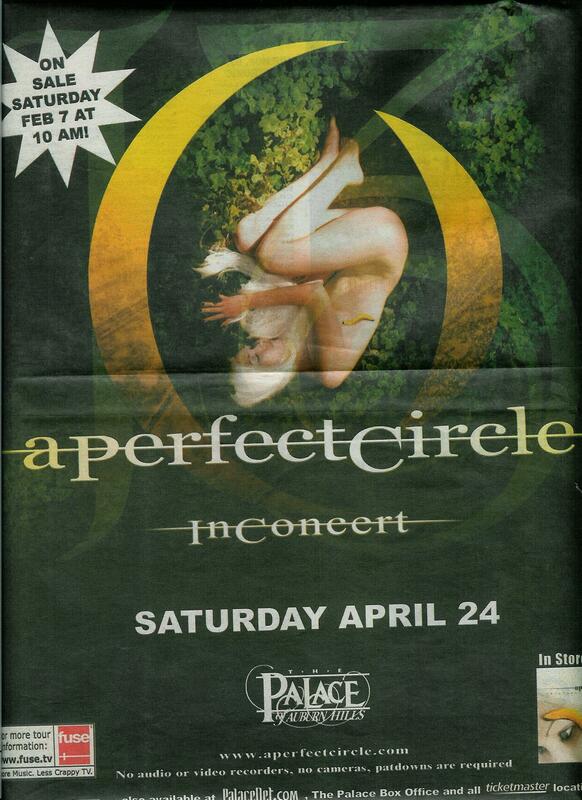 Probably my favorite APC show that I have yet witnessed. Perhaps it had a bit to do with the fact that I had just completed my 8 hour exam for my boards & was quite happy to see them afterwards... and yes I passed the boards. As it was, I ordered tix via presale & received an email a couple days before the show saying that I had early admission. Arrived at the venue, went to the doors & they had already let the people with advanced tix in to get the wristbands from the box, sign waivers then went back outside. So, I basically just walked in & talked to the box office (to get my ticket), talked to security people & asked questions about the 'waiver' until the doors open. Thus, I did not even get searched by security. Was pretty pleased. Todd Fox (Tool head of security) was doing security (w/APC) and he is pretty much a hawk for tapers, people that take pictures or film. Anyway. Mini-Kiss & The Burning Brides opened, was not a big fan of either but worth it check them out. The crowd did not care for Mini Kiss & ended up booing them. APC came out & did the standard show. However, MJK was not pleased with the crowd for disrespecting the opening acts and proceeded to basically berate us the entire show - amusing. Although not an amazingly different performance, the recording came out exactly as one would hope. No complaints, a very accurate capture of APC that, I presume, demostrate how far you can push those CSB mics to get a really nice recording.